Waterfowling and conservation tools now available on mobile devices. 'Mobile access to DU information is paramount in our constantly changing conservation climate, and combining that with waterfowling tools allows our supporters to stay in touch, even from the duck blind,' Anthony Jones, DU web director says. Ducks Unlimited released multiple iPhone and Android apps this fall, providing DU supporters with new tools for waterfowling and conservation. 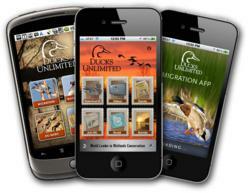 DU has two Android apps and three iPhone apps available, which include conservation news, event listings, migration reports, sunrise and sunset calculator, and a waterfowler’s journal. Currently available on the iPhone, DU offers its original app with event listings, DU news, sunrise and sunset, and waterfowl identification. In September, the organization released an iPhone Waterfowl Migration App, which allows supporters to view and post migration reports from DU’s Migration Map. The newest addition to DU’s iPhone app resources is the Waterfowler’s Journal, an app designed to help document the experiences of every hunt. DU’s Android app includes conservation news, event listings, sunrise and sunset, waterfowl identification, and the ability to view and post to DU’s Migration Map. The Waterfowler’s Journal Android app released early October has the same journal-type functionality as the iPhone version and allows users to document time spent in the field.